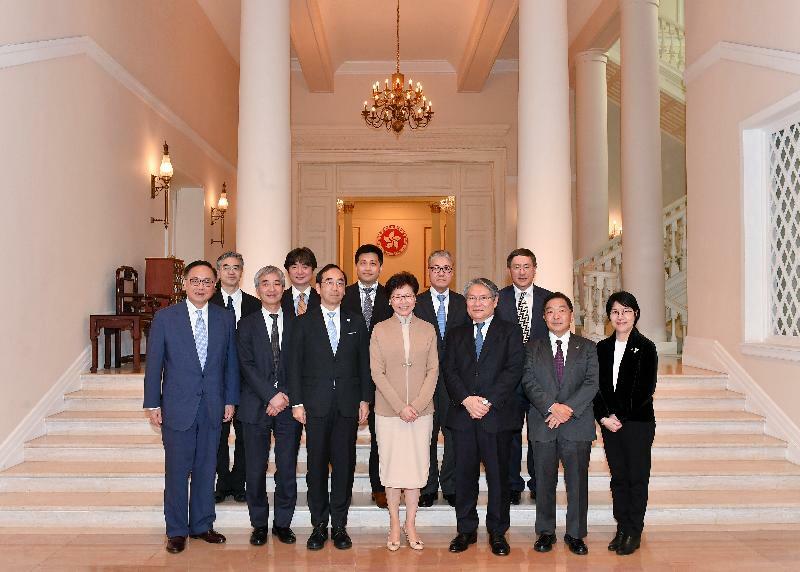 The Chief Executive, Mrs Carrie Lam, met with the visiting Executive Director of the Japan Science and Technology Agency, Dr Yoshimasa Goto, and his delegation at Government House this afternoon (March 18). The Ambassador and Consul-General of Japan in Hong Kong, Mr Mitsuhiro Wada, and the Secretary for Innovation and Technology, Mr Nicholas W Yang, also attended the meeting. Welcoming the delegation's visit to Hong Kong, Mrs Lam said she was pleased to meet with Dr Goto again after her visit to Japan at the end of October last year. She said that she was impressed during the five-day visit by Japan's development and outstanding achievements in innovation and technology (I&T) . While in Japan, she met with representatives of a number of research institutions, universities and the industry to introduce to them Hong Kong's advantages and prospects in scientific research, and she realised that both sides were keen to further their co-operation. Indeed, a joint statement was issued by her and the Minister for Foreign Affairs of Japan, Mr Taro Kono, during her visit on deepening and broadening of co-operation between the two places, in which I&T was one of the areas covered. Noting that the delegation will visit the Hong Kong Science Park and the Cyberport, the two flagship I&T infrastructures in Hong Kong, as well as local universities in the coming days, she said she believes that the visits will help enhance mutual understanding. Mrs Lam said that the Outline Development Plan for the Guangdong-Hong Kong-Macao Greater Bay Area was promulgated last month and that the country attaches great importance to I&T development in the Plan. Pointing out that Hong Kong possesses sound scientific research capabilities, outstanding technology talents and world-class universities, she said that Hong Kong will strive to leverage its advantages to complement the development of the Greater Bay Area as an international I&T hub. She expressed the hope that renowned I&T enterprises and education institutions in Japan would actively consider establishing a presence in Hong Kong to jointly seize the opportunities brought by the development of the Greater Bay Area.